The first year consists of a core programme developed for all students. You will be introduced to the typical PSTS approach by investigating various domains in Social Sciences and Engineering at the University of Twente’s research institutes. You will become familiar with the relevant philosophical theories and methods, the Philosophy of Technology and the multidisciplinary field of Science, Technology and Innovation Studies. You will also engage in a more detailed investigation of topics related to PSTS and prepare for the research-oriented courses in the second year. Note: This is the course overview for the academic year 2017-2018. The schedule is subject to change. No rights may be derived from the information. More information about the course descriptions. 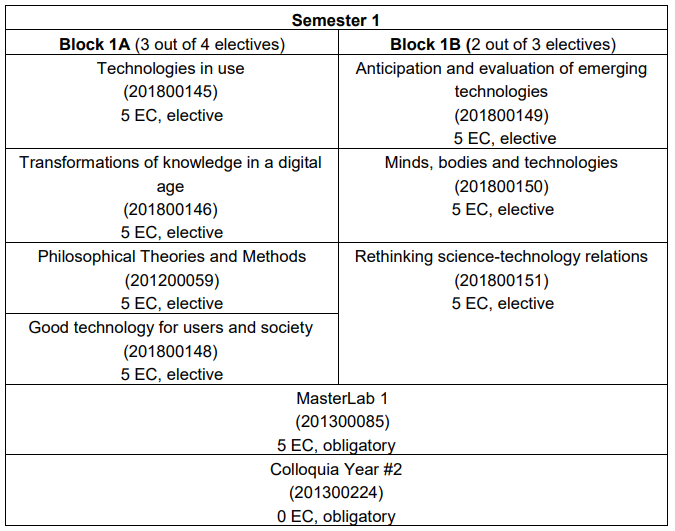 At the end of the first year students have chosen (at least) five out of the standard set of seven electives. Next to these electives, the students start on orienting on a thesis topic and research question during the obligatory course MasterLab 1. In the second semester students work on their thesis choosing an academic or professional profile. In Masterlab 2, students discuss their progress with other students working on their final theses and give and receive feedback on each other’s work.